The developer of the Dakota Access pipeline has reported "recent coordinated physical attacks" on the much-protested line, just as it's almost ready to carry oil. Texas-based Energy Transfer Partners didn't give details, but experts say Dakota Access and the rest of the nearly 3 million miles of pipeline that deliver natural gas and petroleum in the U.S. are vulnerable to acts of sabotage. It's a threat that ETP takes seriously enough that it has asked a court to shield details such as spill response plans and features of the four-state pipeline that the company fears could be used against it by activists or terrorists. Authorities in South Dakota and Iowa confirmed Tuesday that someone apparently used a torch to burn a hole through empty sections of the pipeline at aboveground shut-off valve sites. Mahaska County Sheriff Russell Van Renterghem said the culprit in Iowa appeared to have gotten under a fence around the facility, but Lincoln County Sheriff's Deputy Chad Brown said the site in South Dakota wasn't fenced. The Iowa incident was discovered March 13 and the South Dakota incident Friday. Pipeline operators are asked to report security breaches to the National Response Center. Data on the center's website show no reports from ETP this month. The $3.8 billion Dakota Access pipeline runs 1,200 miles through the Dakotas, Iowa and Illinois. How do you attack a pipeline? Because pipelines mainly run underground, aboveground shut-off valves are natural targets, according to Jay O'Hara, a spokesman for the environmental group Climate Direct Action. That group targeted valves on pipelines in October in North Dakota, Minnesota, Montana and Washington state, though the pipeline companies said activists didn't succeed because none of the sites were operating when the attacks happened. Explosives, firearms and heavy machinery also have been used to try to sabotage pipelines. Securing pipelines is difficult because they often travel long distances through remote and even uninhabited territory, said Kelly Sundberg, a professor at Mount Royal University in Calgary, Alberta, who studies energy infrastructure security and environmental crime. Sundberg said "it's stupid and dangerous" to tamper with pipeline shut-off valves. Modern oil pipelines are "incredibly sophisticated" systems that move huge volumes of petrochemicals at high pressures, he said. Simply closing a valve can cause the pressure upstream to increase quickly, creating a significant risk of a spill that endangers the environment and anyone in the area where the pipe suddenly bursts, he said. In response to the October incidents, federal regulators issued a bulletin warning that tampering with pipeline valves "can have significant consequences such as death, injury, and economic and environmental harm." Sundberg also said that it's ironic for people who say they're concerned about the environment to take an action that could cause an environmental disaster. But O'Hara said: "The hypocrisy really lies in the pipeline corporations who say their pipelines are safe, say leaks don't happen. They blame activists who are trying to stop global cataclysm by taking action to point out what they do every day, which is leak and spill." Someone who targets a pipeline facility in the U.S. could face up to 20 years in prison. Who's responsible for the recent attacks? No suspects have been identified in either state and no group has claimed responsibility. O'Hara told The Associated Press that Climate Direct Action wasn't involved in any actions against the Dakota Access pipeline. 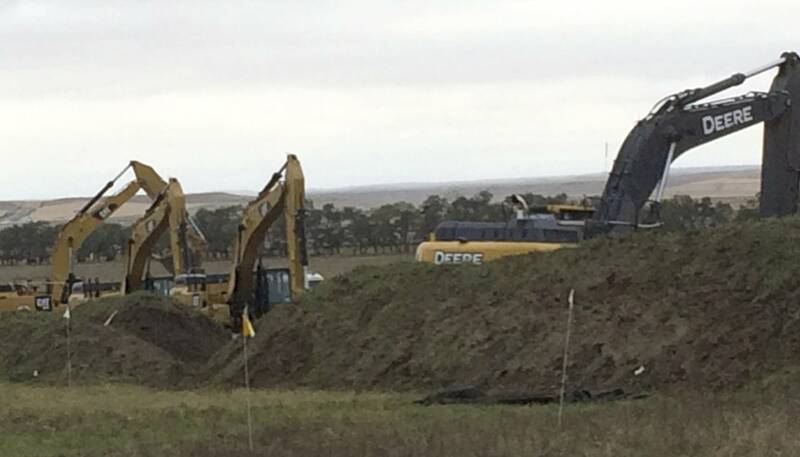 Attorneys for the Standing Rock and Cheyenne River Sioux tribes, which are leading the legal battle against the pipeline, said the tribes don't condone acts of violence against pipeline property. How frequently does pipeline sabotage occur? Not very often, Sundberg said. It happens more frequently in Canada than the U.S. It's generally committed by people trying to make an environmental point. It would be "very scary" if terrorist groups tried it in North America, he said. Some of the worst incidents in the U.S. were on the Trans Alaska Pipeline. Vandals blew up a section in 1978, spilling about 16,000 barrels of oil near Fairbanks. In 2001, a drunken man fired a hunting rifle into the pipeline near Livengood, causing more than 6,000 barrels to spray out. Some of the most notable incidents in Canada happened in the 1990s and 2000s in Alberta and British Columbia. A series of bombings in 2008-09 targeted pipelines in British Columbia. Weibo Ludwig, an Alberta man who crusaded against the extraction of "sour gas" containing high amounts of hydrogen sulfide, was convicted in several of the 1990s acts of vandalism. He was arrested but never charged in the later attacks. Pipeline sabotage happens with some regularity in war zones. Iraqi insurgents, Colombian rebels and Mexican guerrillas all have claimed responsibility for pipeline attacks in recent decades.